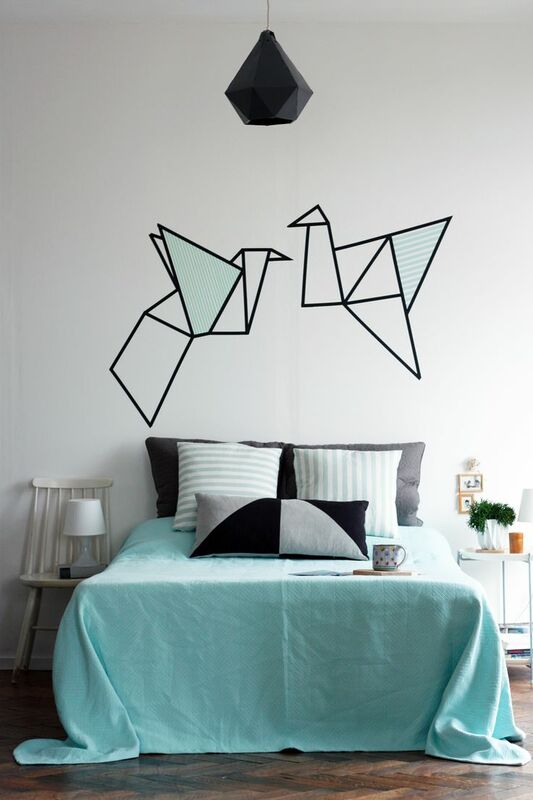 Today I would like to show you a super-cheap way to decorate and revitalize any space of your home: washi tape. With this material you can make a real difference in a room in only a few minutes. You only need to buy enough rolls, have to plan the shapes ahead or do it in a spontaneous way if you are brave and talented enough. In my opinion the most stylish color is black – of course! – but you can purchase the tape in various colors. 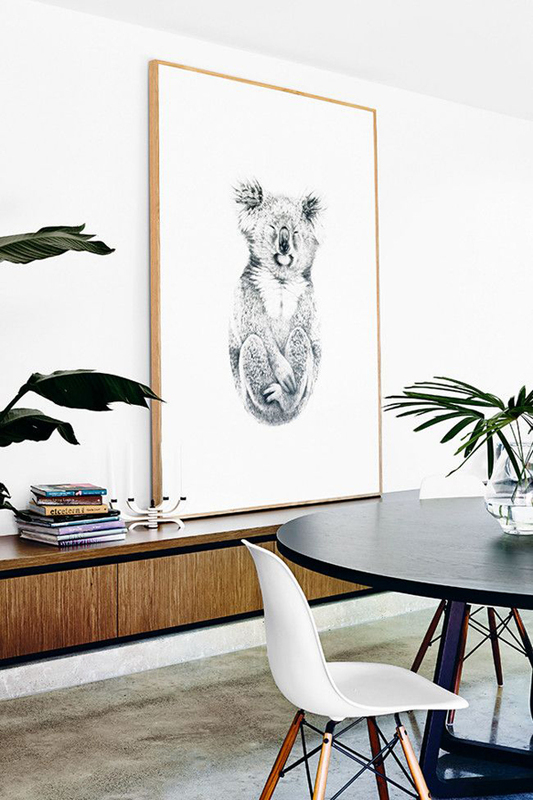 Carla Fletcher’s Koala artwork crossed my cyber path again. After seeing it in the Brooklyn home of an Australian couple, I incidentally bumped into it again, this time in a Melbourne house, hence I decided to show you today that home. There are some similarities compared to the previous interior: the above mentioned artworks, Eames chairs, and Australian residents. However the style and general ambiance is very different. As I anticipated in the end of the previous post today I show you the home of another Australian family. This home has a completely different style and is on another continent. 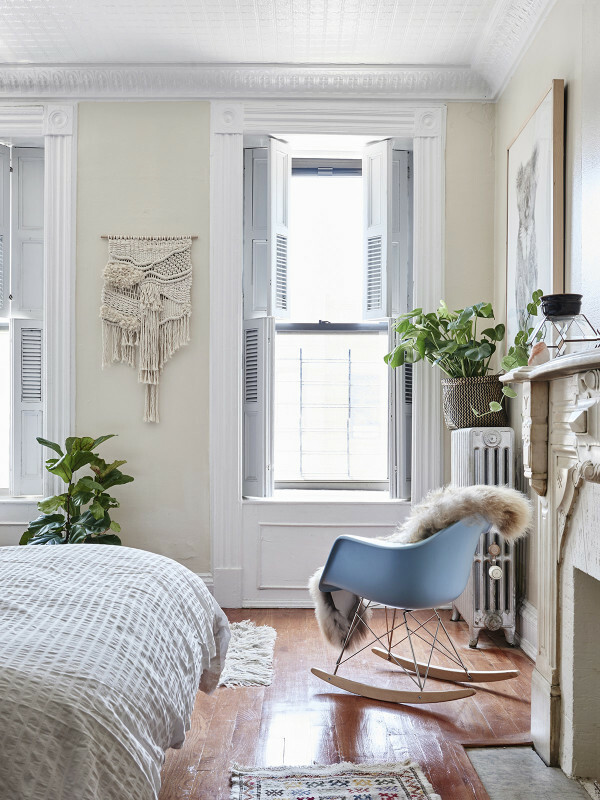 The two-bedroom Brooklyn apartment of textile artist Maryanne Moodie and her partner Aaron Moodie (a designer for Etsy) is a truly beautiful, very relaxed space with lots of light and plants that make the atmosphere friendly and welcoming. Even though they have been living there for only two years, after Aaron got the opportunity from his employer, Etsy to relocate, the apartment has everything we call quintessentially ‘Brooklyn’. 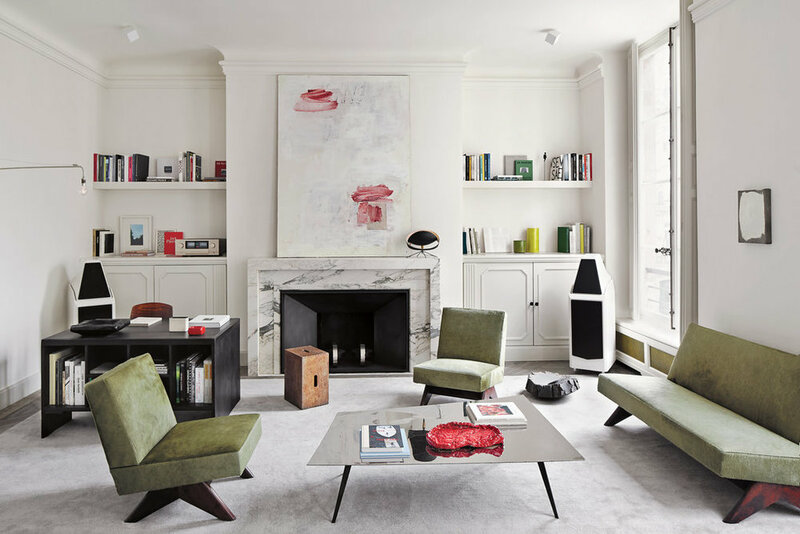 In the previous blog post you could see the high-end home of French architect Joseph Dirand (designer of glamorous boutiques around the world, such as Chloé in Paris, Alexander Wang in Beijing, and Pucci in New York, just to name a few). 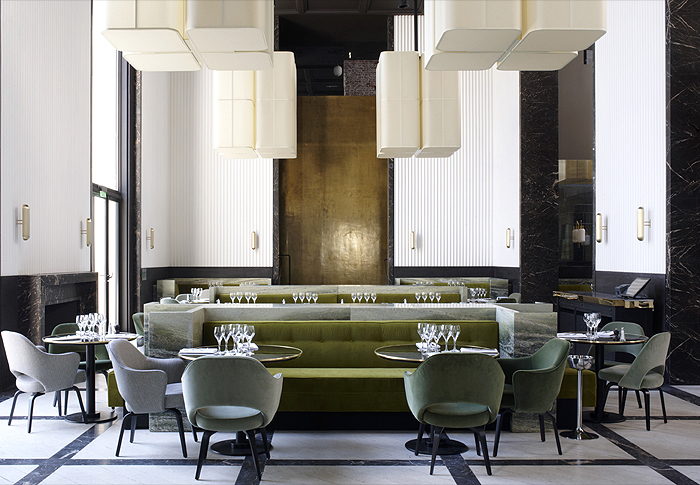 As I promised, today I show you over another masterpiece of this talented interior designer: Monsieur Bleu, a restaurant in Palais de Tokyo in Paris where one can not only enrich with a culinary but also an artistic experience. Just like in most of his works, Dirand combined in this project of 2013 too minimalist details with luxurious materials, classical elements with contemporary ones; and created a heady mix on a grand scale. The result is low-key, intangible, cool and minimal; open and particular, lively and intimate at the same time. This cosmopolitan restaurant was named after a fictional character, M. Bleu, who had been imagined as a cultivated, elegant, mysterious and suave bourgeois gentleman. 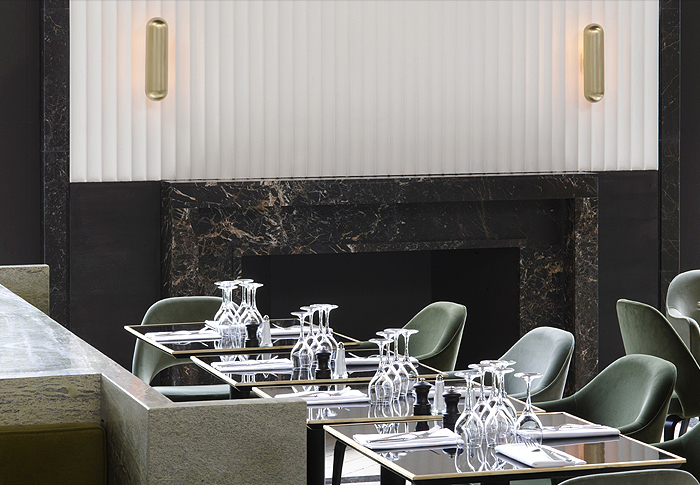 This fictional character ‘guided’ Diran when designing the grandiose interior of the restaurant. He managed to create an absolutely timeless, offbeat and elegant ambiance. Joseph Dirand is one of the most esteemed interior designers of our days. 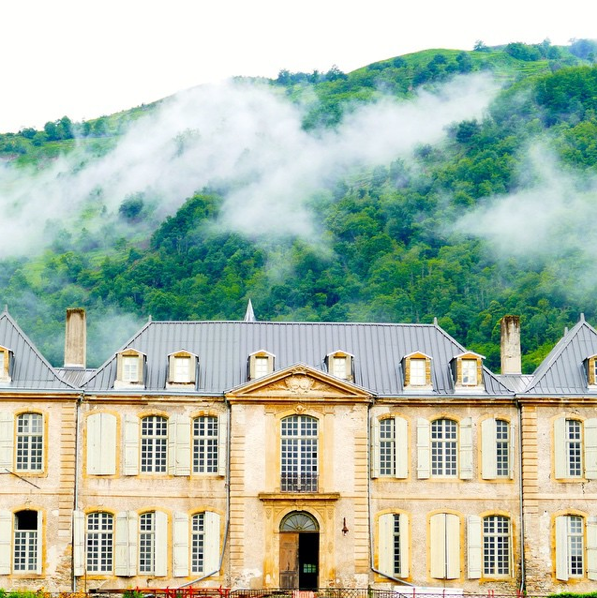 Given that his father, Jacques Dirand has been at least as revered in his field – interior photography – as his son, this French architect had developed, formed, polished his peerless style since childhood. In this post I would like to demonstrate how to pair luxury and minimalism at the highest level possible: The parisian apartment of Dirand is an incredibly high-end interior in which – without any exaggeration – every single piece of furniture and object is placed purposefully, every color and material is chosen thoughtfully – half-baked, random styling can never cross his door-step.